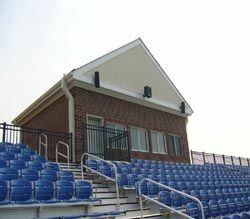 Technomad Noho C and Paris 616 weatherproof outdoor loudspeakers installed on the press box of a new soccer field at College of New Jersey in Ewing, NJ.BOSTON, MA--Technomad Associates, LLC has established a new sales milestone with more than 17,000 loudspeakers shipped worldwide to date. The company, founded in 1995, continues to manufacture all loudspeakers for the commercial pro audio and military/security markets at its Massachusetts facility, where each loudspeaker is bench-built and tested by its small team of craftsmen. "Technomad is proud to contribute to the long-standing tradition of New England manufacturing," said Rodger von Kries, vice president of Technomad. "Our commitment to manufacturing our commercial and military products in the USA ensures the careful craftsmanship of all Technomad loudspeakers is centralized in our Massachusetts facility."